Up close with the retina-beating phone. That's also a tablet. 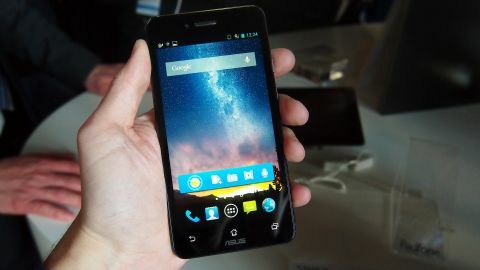 So this is it: Asus' latest and greatest Padfone. Far from being the joke the concept was initially seen as, Asus is serious about its tablet and accompanying slot-in phone and has re-tooled it for 4G LTE, Android 4.2 and provided it with a cracking Full HD display. Indeed, display tech is a key new ingredient in the Infinity mix – the phone part boasts a Super IPS 5-inch retina-beating display at 441ppi which, while looks stunning, doesn't appear that much better than any other top end Android handset (hello, Samsung Galaxy S3). The iPhone's retina display is 326ppi, if you want to know the figures. As with the Padfone 2 (which is coming to more countries including the UK), the slide in and out motion works exceedingly well both in terms of the physical movement – it's completely secure and rubber gromits mean the phone doesn't fall out – and the software, which switches from one screen to the other when you dock and un-dock. The Infinity was announced by Asus' Jonny Shih on stage at MWC 2013, where he was joined by Qualcomm's Paul Jacobs – the new device packs a 1.7GHz quad-core Snapdragon 600 CPU and uses the US firm's third-generation LTE tech. This thing is fast; there's absolutely no lag but then you'd expect that with a quad-core chip. Asus reckons it's possible to get 19 hours of 3G talk time out of the device when it's all fully charged. The Padfone Station dock converts the phone into a 10.1-inch tablet with 1,920 x 1,200 resolution. It can also be used as a battery pack, which gives you three times the battery life and it also has its own 1MP front-mounted camera and a micro USB port. The phone/tablet combo has the same-style aluminium unibody design housing as the Padfone 2. In terms of the other key specs there is 2GB of RAM, plus NFC and 64GB of flash memory. The tablet is able to replicate many of the phone's functions and also has a dialler. Undocking takes you to the same app on the phone. The tablet can also output 1080p Full HD video via an adapter for its micro USB socket. The Infinity can also capture 8 still photos per second in burst mode. Asus previewed the Padfone Infinity includes Echo, essentially the same as Apple's Siri, but with some typically Asus effects. Say 'cheese' and it will take a photo of you. The Padfone is a thing of beauty. It's not for everyone but many of us do have a use-case for it. If you have a tablet yet find yourself using more things on your phone then Asus believes you'll be in its Padfone queue. The device is certainly a looker and does have a lot to offer - the smartphone itself is superb. It does have a premium price point of 999 Euros though - $1325 or AU$1287 - and so it will be interesting to see if Asus can shift them. In the UK, Asus is launching the Padfone 2 for now, though it hints the Padfone Infinity will arrive - probably around £799.